Add some flavor to your filtered water with fresh fruit and herbs for the most delicious and refreshing way to hydrate! How epically delicious do these infused waters look? We’ve been using all 4 of these recipes while in San Miguel and all I can say is I CAN NOT WAIT for summer when produce is abundant and affordable! Staying hydrated during the day is hard for me, but when my water looks and tastes this good…all I want to do is drink more. I have been absolutely loving my PUR water filter (here is the one I have) not only for the perfect cup of coffee…but for the perfect cup of infused water. YAS. The water tastes SO GOOD coming out of that thing. It removes lead and mercury and reduces chlorine. Yes, yes, and yes. This is key for epic infused water because you get so much fresh flavor! The PUR filter just hooks right onto your faucet and you can switch between unfiltered and filtered with the flip of a switch. 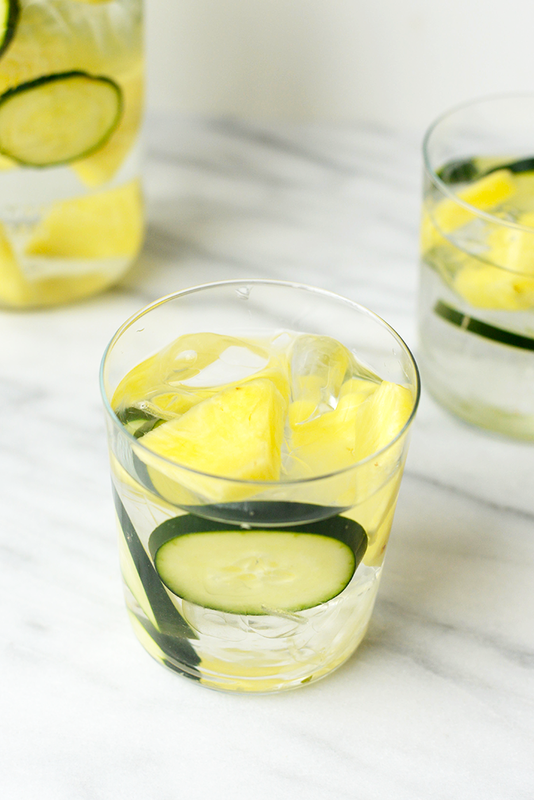 When it comes to infused water…anything works! All flavor combinations are welcome. I suggest buying whatever fruit and herbs are on sale and going from there! In this post I paired together some of Linley and my favs that we drink often during our work week. What is your favorite infused water combination? This post is sponsored by PUR. I was compensated and all opinions are my own. Thank you for supporting Fit Foodie Finds!